If you have a new puppy chances are you're researching kennels and crates. 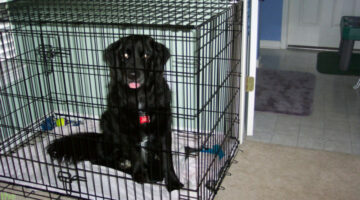 Here you'll find our best tips for finding the right kennel or crate for your dog. We're also sharing great ideas to help you to train your puppy to stay in his crate and what you need to know about boarding your dog at a kennel. Whether you buy a dog house or build a dog house, there are lots of types, sizes & styles to choose from. Dog house ideas from practical, to fun, to fancy! Treat Me Tuesday: Win a FREE Overnight Stay at PetSmart’s PetsHotel! Looking for the best place to pamper your pooch while you’re out of town? PetSmart’s PetsHotel is it…and here’s your chance to win a FREE overnight stay for your pup!